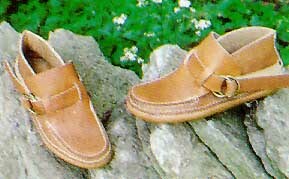 The double-ring cinch strap design provides the benefit of a higher cut moccasin with the convenience of no tying. The singular design of this moccasin provides stylish comfort for daily use. A very unique, crafty look, along with long wearing comfort.